I make several different versions of chicken curry soups just because I love the flavors so much! 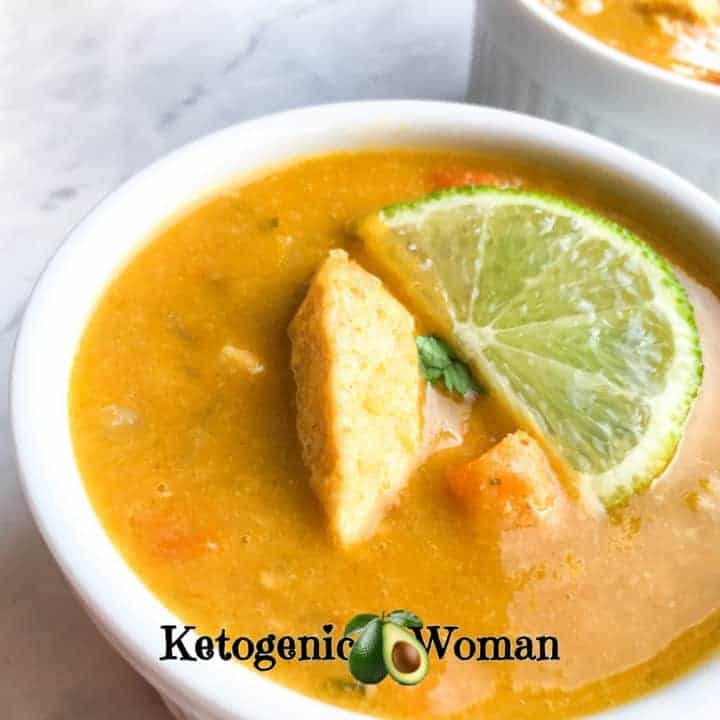 Which version of this flavorful low carb curry soup I make is really all about what I happen to have in my pantry and fridge on that day! And if you are doing Paleo or Whole 30, the ingredients are so flexible to switch up to fit any keto or low carb type of protocol. I’ve also included instructions for both Instant Pot (because I’m all about my new toy these days!) and the stove top, so worry not! Both are easy peasy! Is Coconut Milk Keto Friendly? I wanted to be sure to answer this because people new to keto have this question a lot! The answer is yes! 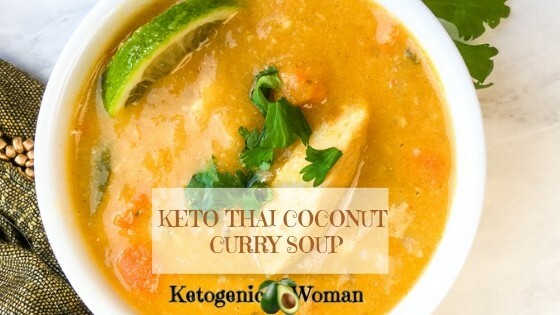 And coconut milk is one of my favorite ingredients for making keto thai recipes like this. It’s high in fats, the really good for you MCTs that come from coconut oil! It’s low in carbs and its dairy free. Where I shop, it comes in low fat, regular and full fat. 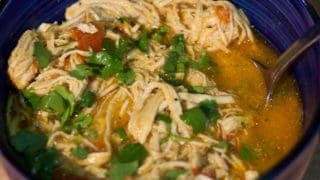 Use whichever one suits your macros the best, all will be delicious in this chicken curry soup recipe. You’ll need to gather a few standard pantry items as well as some you may or may not keep on hand. The ingredients in blue are linked to Amazon so you can check them out. If you buy them I do make a small commission which doesn’t affect your price but DOES help me keep this site alive! I have the 6 qt Instant Pot and I find it to be perfect for a family of four. One main reason that I like the Instant Pot so much is that everything has a more tender texture and deeper flavors due to the pressure cooking. Add the chicken and cook, stirring often, until the breast develops a bit of color,around 4-5 minutes. Season with salt and black pepper, to taste. Instant Pot: Add the rest of ingredients now (except the lime slices and cilantro). Stir to combine. Set lever to vent position and lock lid in place. Set to Soup. Add the garlic, ginger, coriander, cumin and red curry paste. Cook for 1-2 minutes or until the spices become fragrant. Add bell peppers and season with additional salt and pepper, if desired. Stir to combine and cook until peppers soften and develop a bit of color, about 1-2 minutes. Add coconut milk and simmer until slightly thickened, approximately 4-5 minutes. Stir in spinach, lime juice, and maple syrup. Taste and adjust seasonings, as desired. Instant Pot: Allow to Natural Release for about 10 minutes, then unlock the lid. Serve immediately topped with fresh cilantro and lime slices, if desired. See ingredient notes in main article. 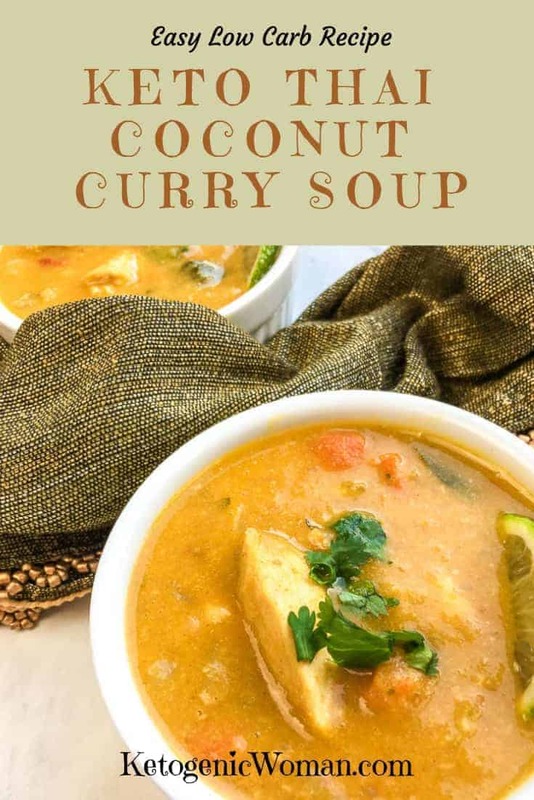 Super fast and low carb easy shredded coconut curry chicken soup. 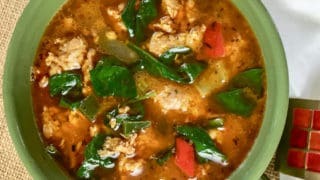 This delicious sausage soup has a satisfying combination of spicy Poblano pepper, classic herbs, and an interesting blend of spices. 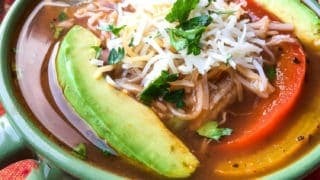 A delicious healthy easy Mexican theme soup to warm you up! Turns out fantastic in the Instant Pot. Tagged chicken, instant pot recipes, keto soups. Bookmark the permalink.